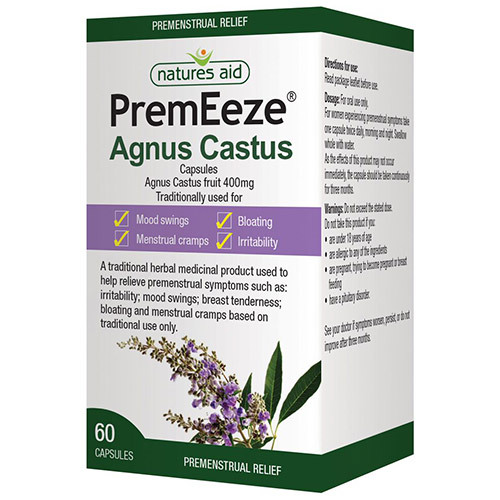 Natures Aid PremEeze Agnus Castus is a traditional herbal medicinal product used to help relieve premenstrual symptoms such as: irritability; mood swings; breast tenderness; bloating and menstrual cramps based on traditional use only. For women experiencing premenstrual symptoms: take one capsule twice a day, morning and night. Swallow whole with a glass of water. Do not store above 25°. Below are reviews of Natures Aid PremEeze - Agnus Castus - 60 Capsules by bodykind customers. If you have tried this product we'd love to hear what you think so please leave a review. The product came really quickly. It is what I needed. I have only been using these for about a month and a half but they have made somewhat of a difference. I take them to reduce irritability and I do feel they are working. It can take 3 months to start to make a change and as I'm half way to that point and things already seem somewhat better I'm expecting things to get even better. As for the price... I am well happy! And the complimentary bag was a bonus. Also delivery was very swift and customer service is absolutely lovely. Will definitely be happy to make repeat purchases. 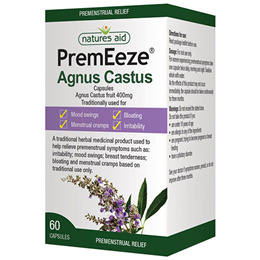 Agnus castus has been a massive help with my menopausal symptoms. (Doctors in Germany actually prescribe it to their patients for that reason.) I've tried a few brands, and these seem to match up ok. My hot flushes have been a little more prevalent but that could have nothing to do with my having tried this new brand. (I won't know until I've switched back to the most recent brand, Periagna.) It's worked just as well at reducing the spotting and flooding and has minimised the mood swings. I tried the Vogel tincture first, as it's a brand I trust, but it upset my stomach too much. Both this and the Periagna don't contain any fillers, so I'm going to go back to the other brand to see if it reduces the 'power surges' (what a misnomer that is) and then will leave another review.